← I Need A Moment. Just a little over a year ago, I published a post regarding a precious gift that our daughter (nine years old at the time) gave to our nephew on the day he was born. As you can see, the painting is wrought with spelling errors. But my sister was so touched by the sentiment that she Tweeted about it. Within minutes, she got a mean-spirited reply from one of her followers that attacked our daughter for her spelling mistakes. The Tweet really bothered my sister so she replied to set the man straight. And I tossed and turned all night long trying to figure out why it was keeping me up. You can read the post that was born out of my late-night reflection by clicking here. So fast-forward exactly one year and two weeks later. Saturday evening, we were at my sister’s house to celebrate Baby P’s first birthday. When we arrived, my sister was up in the baby’s room changing his diaper after his nap. Our daughter, who adores Baby P, flew up the stairs to see him, and while she waited for my sister to finish what she was doing, she stumbled upon the painting, which is proudly displayed on a book shelf in the baby’s room. Wow. Aunt Linny…I misspelled that whole thing. I’m so sorry! My sister laughed. Hugged her. And told her that the spelling errors made it all the more precious! Because she knew our daughter copied that verse from the depths of her heart, not out of a Bible where she could have copied the words verbatim and achieved perfect spelling as a result. When my sister shared the story with me, it got me thinking about all the hand-wringing we do as parents. When our kids struggle with something, we stress about it. And especially with our firstborn, we wonder. We’ll they ever overcome it? Now at the time of my first post, I wasn’t stressed about the spelling errors in the picture. I understood that our daughter was so caught up in the emotion of making something beautiful for her brand new cousin, that spelling was the very last thing on her mind. But I did begin to stress at the beginning of this school year (only 5 months later) when academics began to be a bit of a struggle for her. Spelling was one of several areas of concern, and I began to wonder if we’d make it through to the other side. But with three extremely supportive teachers, several conferences to develop a strategy, my undivided attention during homework each afternoon, our daughter’s work ethic, and a lot of prayer (together and individually), we’ve punched through it. Our daughter is doing great, and it looks like we won’t just survive fourth grade. We’ll actually conquer it! And I’m so proud of her effort. Whatever they are, I won’t tell you not to worry. Because that’s like telling a child not to be afraid. I know it’s in our DNA as parents to stress. To wring our hands. And to wonder if this, too, shall EVER pass. But I also know that God is faithful. And that we’re not alone. Because He walks every step of this journey called parenthood with us. He listens to our prayers. And He provides us all the wisdom and discernment we need along the way. This is precious and so encouraging! And a year later, I think I prefer this painting with the misspellings! She offered to redo it and I said, “absolutely not!” Oh, and PS, this is the Psalm R’s class learned this year! So appropriate. 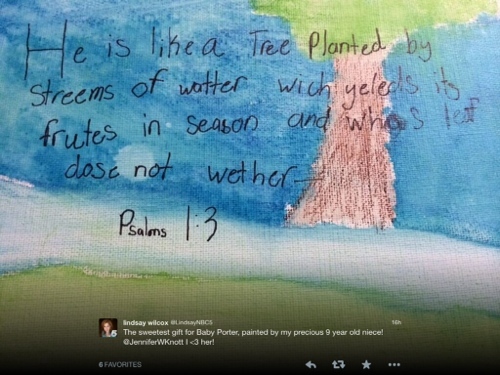 I didn’t know R was learning that Psalm this year. How special! I love that she offered to redo it but love it even more that you said no! Thanks for seeing the beauty in the mistakes. She’s blessed that you are her aunt! You are too kind! Thank you for these words of encouragement that will help us stay grounded with life gets too busy and we lose our focus!